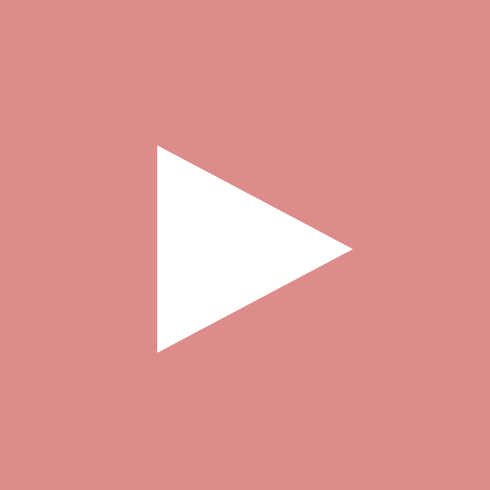 Buenos Aires, October 9, 2018.-"The rules are the ones that make the very existence of a community possible. They are the Community. 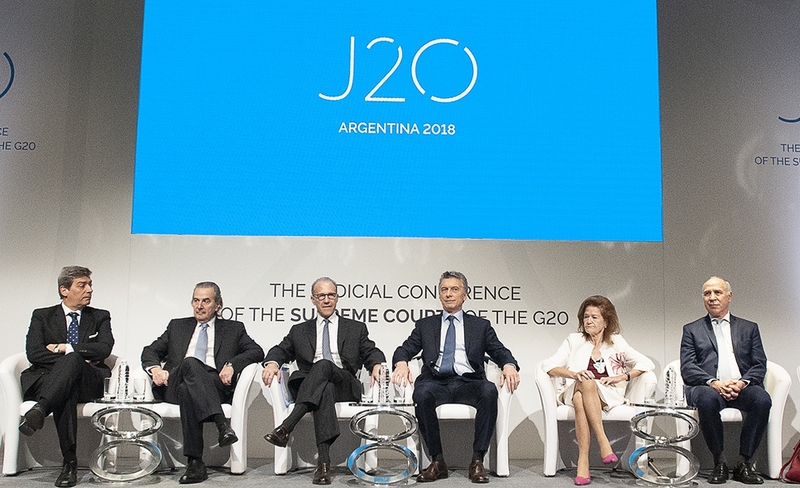 There is no real community without rules", said the president of the Supreme Court of Argentina, Carlos Rosenkrantz, during the opening of the J20, which was attended by the president of the country, Mauricio Macri. With the participation of the remaining justices, chief Justices, presidents, and judges of international courts, highest courts and constitutional courts from G20 countries and guests, Chief Justice Rosenkrantz said that while the economic and social conditions are necessary to generate equitable and sustainable development, a crucial condition is the "existence of rules". "Without rules there is no equitable and sustainable development possible, for the simple reason that only the rules can structure cooperation. Without rules it is impossible to generate incentives for the interactions of the members of a society to be cooperative and, to design the necessary mechanisms to distribute the benefits of such cooperation", appointed. Rosenkrantz remarked that "the rules limit us, but at the same time they protect us. As long as they protect us, the rules allow not only cooperation, but also make our freedom possible. Without rules not only there is no cooperation, but there is no freedom. 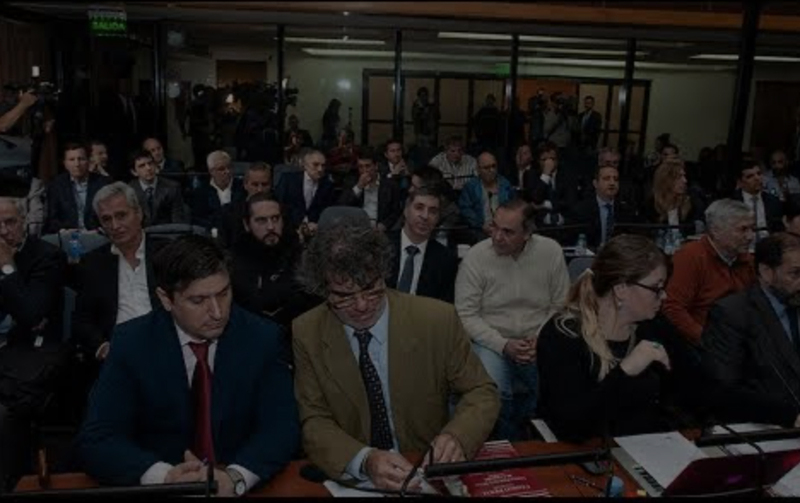 Besides, President Macri emphasized the importance of the generation of consensus for the construction of a balanced and sustainable community. "You are actors (protagonists) and have a role to play", he said, and deepened in the respect for the law, transparency and the fight against Corruption. The speech, the first one given by Rosenkrantz since the inauguration of the presidency of the Court on October 1st, was before an auditorium composed of chief justices, justices and judges from Germany, Brazil, Canada, Chile, China, Korea, Spain, France, India, Indonesia, Italy, Jamaica, Mexico, Netherlands, United kingdom, Russia, Rwanda, Senegal, Singapore, South Africa and Turkey, United Nations courts, Africa, Europe, the Caribbean and the Interamerican courts, Federal and national Judges. The objective of this first J20 meeting revolved around the same question that ran throughout all the meetings that were held this year in the context of the G20: how to build a consensus for equitable and sustainable development and in particular, what is the role of the judges in this. Last night, Justice Elena Highton, deputy chief justice, pronunced the welcome words and toast in the framework of a dinner held in the Justice Palace, while on todays morning, she emphasized her role as the only woman justice of Argentina and greeted all women justices and judges present. On the other hand, in his speech the Chief justice referred to the impartiality and independence of the judiciary, not only of other powers, but also of their own convictions, and spoke of the complexity of the task they must develop. "The possibility that the rules exist in a community (not as graphs written on paper but as categorical behavioral habits) requires the existence of Judges. It requires an institution, that before doubts, clarifies what the rules require and, in case of non-compliance of the rules, to apply, impose and execute them. That institution is the Judiciary. The courts that integrate it, "he added and remarked:" we must be the custodians of these rules. The judges are irreplaceable to cement cooperation within the framework of our communities. " In our democracies "there is a growing tendency to the judicialization of absolutely all matters", the judges are "subject to criticism from those who believe that we have no legitimacy and those who ask us to solve a large part of the matters of interest, task for which it is required the legitimacy that many say we do not have. " In that line, and before closing his speech, Rosenkrantz pointed out that "societies that achieve a greater degree of equitable and sustainable development are societies whose judges are more independent and impartial." After the speeches, the magistrates were taken to the CCK where the J20 meetings will take place until tomorrow in series of panels and workshops. Dr. Horacio Rosatti moderated the first panel on "Rights and fairness", attended by João Otavio de Noronha (Brazil); Roger Bilodeau (Canada); Yves Gounin (France); Daria de Pretis (Italy); Jorge Mario Pardo Rebolledo (Mexico); Larisa Karasavchikova (Russia); MehmetKürtül (Turkey), Sylvain Ore (African Human Rights Tribunal) and Ricardo Pérez Manrique (Inter-american Court of Human Rights). Dr. Ricardo Lorenzetti moderated the second panel, on "Sustainable development", with the participation of Laurent Fabius (France), Pascal Chauvin (France), Sharad Arvind Bobde (India), Mamadou badio Camara (Senegal), Saïdu Nourou Tall (Senegal) and Alejandro Álvarez (state unit of lathe Rule of Law, Executive Office of the General Secretary of the United Nations). Dr. Juan Carlos Maqueda opened the first panel of the second day, on "Strengthening the rule of law". There participated Ulrich Hermann (Germany), Sibylle Kessal-Wulf (Germany), Giovanni Mammone (Italy), mandisa Muriel Lindelwa Maya (South Africa), Zühtü Arslan (Turkey),Lord Justice Gross (United Kingdom), José Antonio Gutiérrez-Fons (court of Justice of the Union and Iván Aróstica (Chile). Dr. Elena Highton -Nolasco moderated the "Judicial reform" panel, with the attendance of Liu Hehua (China), Kwon Soon.-il (Korea), Pyotr Serkov (Russia), Jeffrey minear (United States), haroldo Osvaldo Brito Cruz (Chile), Theo Groeneveld (Netherlands), Steven Chong (singapore), Jesús Gullón Rodríguez (Spain) and Adrian Saunders (Court Of Justice of the Caribbean). The last panel, "Global democracy and global markets", was moderated by Chief Justice Rosenkrantz, with the participation of Anwar Usman (Indonesia), Mogoeng Mogoeng (South Africa), Bryan Sykes (Jamaica), Emily Kayitesi Rusea (Rwanda) and Juan Antonio Xiol Rios (Spain). In parallel, in a series of workshops involving federal and national judges, worked on Social rights (with the words of Sylvain Ore and Ricardo Pérez Manrique); The role of justice in the fight against corruption (João Otavio de Noronha, Mogoeng Mogoeng, Guillermo Silva and Juan Antonio Xiol Ríos); The role of justice in the fight against drug trafficking (Alejandro Álvarez), and justice and gender (Mandisa Muriel Lindelwa Maya). The closing words and conclusions of the event were in charge of Dr. Ricardo Lorenzetti. Buenos Aires was the first session of the J20, based on the conclusions of Hamburg, Germany, reached during the meeting of the last G20. rules, justice, judges, sustainable, courts, rosenkrantz, chief, development, justices, court.